Our CUSTOMER OF THE WEEK, Jeanne, came in to Eye Spy looking for a new look. She liked an Anne et Valentin frame, but wanted to make sure she liked the color, so she took advantage of the November Trunk Shows and came in to do a little trying on of this and that. Still, it was the original frame that held her heart. But here’s the kicker, Jeanne has really light (and lovely) blue eyes, so sun protection is very important. With the style frame she chose, a sun clip can be tricky. The traditional model has little claws that go over the side of the frame, which on a plastic frame is great, but on a metal frame can scratch the paint and make the frame look more worn than it is. But Jeanne has great timing, yes she does, because she came in to Eye Spy shortly after the launch of the Chemistrie sunlenses. The Chemistrie sunlens is a clip that puts a small magnet in the lens of the glasses and a small magnet on the sun clip so when wearing the clip, the frame looks seamless and as though it was meant to protect baby blues from the sun’s craaaaazy rays. Congratulations Jeanne, your new glasses look fantastic AND they’re taking good care of your gorgeous eyes! It’s almost time to bid adieu to our November trunk shows, which have featured all of the new frames from our favorite lines! 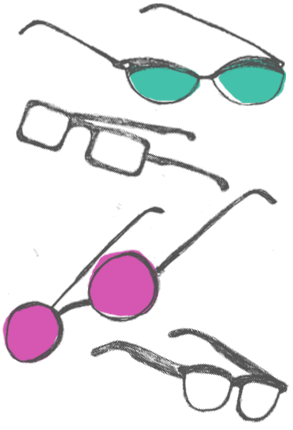 Hundreds of new frames, in every style and color imaginable. Come in next weekend for the IC! 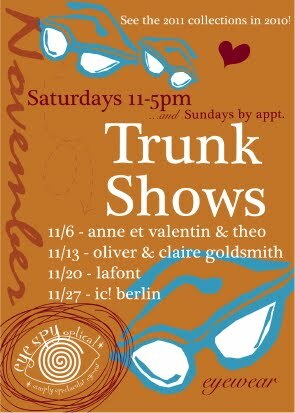 BERLIN Trunk Show on Saturday, November 27 from 11-5! And if, during the month of November, you bring canned food for donation to Lakeview Pantry, we will take $25 off your complete Rx eyewear purchase.